How much air should I put into my bike tires? In other words, what’s the ideal tire pressure for my bike? Now, the answer is not as straightforward as it seems. The ideal tire pressure for you depends on a lot of factors such as tire type, width, compound, your weight, rim width, riding and surface conditions. Notice that I specifically mentioned you. That’s because the ideal tire pressure for each one of us will vary. Before we go deeper into the details, here’s a quick overview of the tire pressure range for each type of bike tires. Finding the correct tire pressure for you and your bike requires you to understand and appreciate all the different factors that could affect the performance of your tires. Here are 7 of the most common factors that affects the tire pressure. 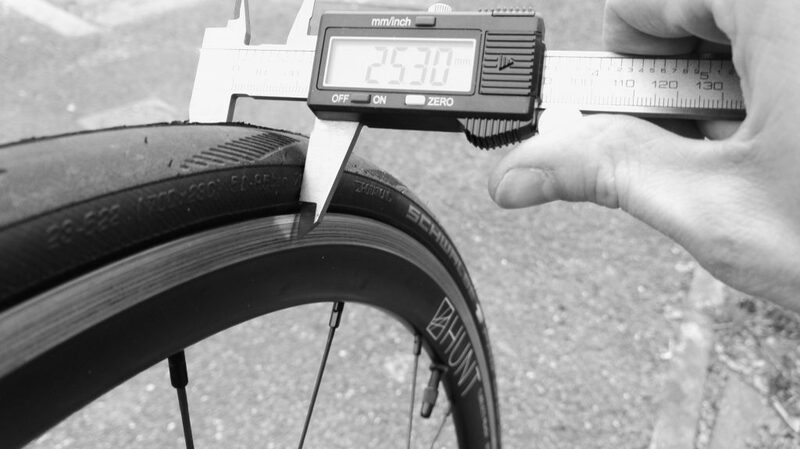 Your weight (body + bike) is arguably the most crucial aspect to consider when determining the right tire pressure for your bike. And that’s why I’ve stated earlier that it differs for each and every one of us, given that the other factors remain constant. The above chart from Frank Beto provides a basic explanation of the ideal tire pressure. Note that it mentions Wheel Load on the x-axis and and total weight. That’s because the weight distribution between front/rear wheel is not 50/50 but more towards 30/70. There’s more weight loaded on the rear than the front, which is why you’ll also notice your rear tires usually wear out quicker. The more the load is on the tire, the more it’ll be deflated and hence increasing the rolling resistance. This can be countered by increasing the tire pressure. Hence, a lighter cyclist typically needs a lower tire pressure compared to a heavier rider. Running on a higher tire pressure for a light cyclist provides little benefits to rolling resistance. This could easily result in an uncomfortable and bumpy ride as the bike experiences more vibration due to the hard tires. PRO TIP : Lighter riders can run on a lower tire pressure compared to heavier riders, given that all the other factors remain constant. Most 700c road bike tires are currently sold in either 23 or 25mm width. However, 28mm bike tires are gaining serious traction as the quest towards wider and more comfortable tires intensifies. These days, wider tires are becoming more fashionable, even for the pros. Just 5 to 7 years ago, it’s uncommon to see procyclists riding 25mm tires. But it’s a norm today. In some races such as Paris Roubaix and Tour of Flanders, 28mm is the norm while some will run up to 30mm too. The answer lies in a concept called casing tension. Here’s a simple explanation. If you’re a geek, FLO Cycling has a thorough explanation using mathematical formulas. As the bike tires get wider, the casing thickness remains the same (we talking about the same tire, just different widths). Thus, in order to maintain the same casing tension for both the 23mm tire and 25mm tire, the 25mm would need to run at a lower pressure. Lower tire pressure also means that its contact patch increases and this increases grip, especially if you’re riding in wet conditions. Though lower pressure offers enhanced comfort, you should be cautious not to drop the tire pressure too low since it increases the chances of snake bite punctures which occur when the inner tube is trapped between the tire and the wheel rim. Regardless of the tire width, you’ll also want to be within the recommended (minimum and maximum) tire pressure. You can often find these values are usually printed on the tire sidewall and rim as well. Do note that some carbon clincher wheelsets have a maximum pressure which is lower than the tire’s maximum pressure. PRO TIP : Wider tires can run at lower pressures. Generally tubular tires are superior to their tubeless counterparts because they are suppler and have lesser rolling resistance. That’s why you see them often used in racing especially by the pros. Sometimes, tubulars are referred to as tubs or racing tires. Tubular tires can run much higher tire pressure than clincher tires due to its one-piece design. The tube is sewn inside the tire, unlike a clincher tire where the tube and tire are separated. PRO TIP : Tubulars can run higher pressure compared to their clinchers counterpart. The tire compound usually has a considerable effect on how tires behave upon inflation. To get the most performance out of the tire casing, you can consider going for supple tires. Typically, race tires are more supple than training tires. Supple tires are softer and hence can flex easily. This is countered by using a higher pressure. On the contrary, a stiff sidewall will require more energy to flex; hence you can run it on a lower pressure. Numerous rubber compounds and tire casings are currently used in the bike industry. The most talked about compound is graphene, which is used by Vittoria in their latest Corsa range. PRO TIP : Suppler tires can run on a higher pressure. The shape and size of a clincher tire are often affected by the internal rim width. Every width of tire has its ideal internal rim width as suggested by the ETRTO standards. These days, you’ll often see road bike wheelsets with the description 15C or 17C. This indicates the internal rim width. The ideal width for 15C rim width is 23mm while 17C is 25mm. Have you heard about the light bulb effect? This happens when you run a wider tire on a narrow rim, such as a 28mm on a 15C wheelset. While wider tires are more comfortable, it’s not recommended with a narrower rim as it’ll drastically affect the bike handling, especially during cornering. For the aerodynamic geeks, you might want to do the opposite. Consider running a narrower tire on a wider rim, such as a 23mm tire on a 17C rim. Check out the results of a bicycle wheel aerodynamics testing performed by Hambini Performance Engineering. PRO TIP : Use the right tire width prevents the formation of a bulb shape. This refers to the nature of the surface you are riding, and it could be uneven terrain or a paved road. For uneven terrain, lower tire pressure (though not too low) helps the tire deform easily to absorb vibrations. And for paved roads, higher pressure helps reduce the rolling resistance. One good example is to compare track racing to mountain biking. Both are on completely different ends of the spectrum. Indoor cycling velodrome’s surface are smooth and hence track bikes usually run a very high pressure between 140 to 220 psi. On the other hand, mountain bikes’ tire pressure are usually between 25 to 40 psi. While the tire pressure plays an important role in your ride comfort, don’t discount the type of bike frame you’re riding. A carbon frame is usually less compliant and harsher than a steel or titanium. PRO TIP : Consider lowering the tire pressure if you’re riding on uneven surfaces. Wet conditions, often as a result of rain could mean reducing your tire pressure. There’s no magic number of how much you should lower. In practice, most cyclist usually give the presta valve 2-3 short presses to lower the tire pressure. The main reason you want to lower the is to increase traction in wet conditions. A larger tire patch in contact with the surface will provide you with more grip. PRO TIP : Slightly lower the tire pressure if you’re riding in the wet to improve grip and traction.